Little Common Football Club player-manager Russell Eldridge stressed the need for consistency after holding title-chasing opposition last weekend. 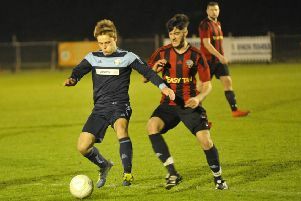 Relegation-threatened Common produced a hard-working display to draw 1-1 at home to second-placed Newhaven in the Southern Combination League Premier Division. Eldridge said: “It was a pleasing performance and a pleasing point to pick up, but we’ve had that performance before and the next game has let us down. There’s no point having a good performance one week and nothing the next week. We need to strive for that consistency. “It’s frustrating because we are capable of it when we put our minds to it. It comes down to attitude and the way we apply ourselves from game to game, and just making sure we’re able to find ways to get results - we’ve not always been good enough at doing that. Despite picking up a very commendable point, the Commoners dropped a place to third-from-bottom of the table and they are just one point above the two relegation places. Next up for Common tomorrow (Saturday) is a trip to Lingfield, who are faring comfortably the best of the three promoted sides in eighth place. “It’s a tough place to go, they’re doing well,” continued Eldridge. “We know every game is a tough game and we have to make sure we do everything in our power to come away with a result. Common, who drew 1-1 at home to Lingfield in August, have drawn five and lost seven of their last 12 league encounters. Their last victory was back in late October. Sam Ellis and Lewis Parsons are unavailable, and Eldridge feels Common are a little bit short in the wide areas, which is something he plans to look at.